Sydney Davis Bruford was born in 1890, and baptised on 21st September 1890 in Mickleham. The son of Charles Bruford of Somerset (1851-1923) and Dinah Davis (1857-1938), who were married in Greenwich in 1879. Sydney came from a large family. The family lived at Fernbank Cottages, Bittern (Byttom) Hill, Mickleham, next door to the William IV pub. The house was not just lived in by this family, but was also occupied by the David family, albeit as a separate household. The head of the household Charles was a gardener. The children excelled at school and won prizes for attendance – the brothers attended Evening School which was voluntary. George and Wilfred worked at Swanworth Stud Farm, Swanworth Lane, Mickleham, owned by Leopold Salomons of Norbury Park. Salomons was famous for his shire horses – bred at this stud farm. Wilfred was a bugler, who played the Last Post at the dedication of Mickleham War Memorial in 1920. In 1911 Sydney was working as a footman to Lord Robson at 26 Eaton Square Belgravia. He enlisted in the 6th Battalion Queens Own Royal Regiment at Guildford and was sent to France in June 1915. The 6th Battalion of The Queen’s (Royal West Surrey) Regiment was a service battalion formed at Guildford in August 1914. In May 1915 it was mobilised for war and landed at Boulogne. At the beginning of October 1916 the battalion was at a shelter camp near Albert in the département of the Somme, close to the Allied Front Line, moving into the front line trenches in Guedecourt on 3rd October. During the following two days the front line was shelled intermittently by the Germans, resulting in numerous casualties. 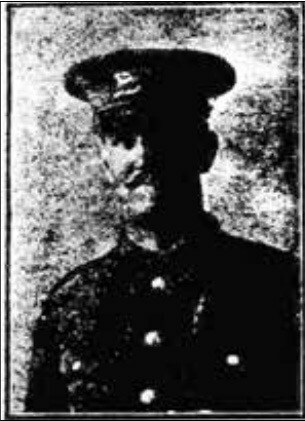 Sydney Bruford was one of three men from his battalion killed on 5th October. According to Sydney’s obituary in the Dorking Advertiser he was the first Mickleham man to join up and also the first one to be killed in the service of his country. The newspaper also noted that all seven of the Bruford brothers were in the Forces. Sydney’s friend Private G Clabon of the Queen’s said that Sydney, who was a great favourite with the men, had been hit by a shell and died about half an hour later. He was buried just outside a small village near the front line.